Mr. Schlueter admires Curt Tomasevic's medal. Mr. Gabel, left, introduces his fellow Shelby native, Olympic Gold Medalist Curt Tomasevic. The "show" helmet was signed by Tomasevic's teammates from the 2010 USA Bobsled team. 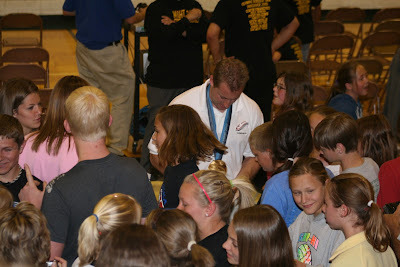 Tomasevic patiently signed papers, notebooks and t-shirts for Exeter-Milligan students and community members. He definitely has a story to tell. A story of Olympic gold, but the story has a strange twist. How do you fit bobsledding onto the plains of Nebraska? Curt Tomasevic didn't even think of bobsledding while he fought his way onto the Cornhusker football team. Growing up in Shelby, Neb. the closest he ever came to a bobsled was "riding on a saucer sled behind a four-wheeler." 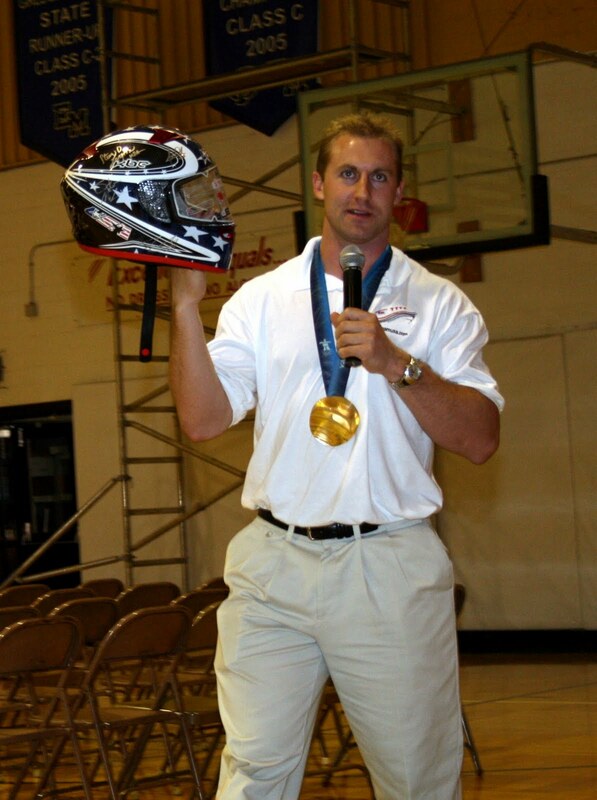 Now, he has won an Olympic gold medal in bobsledding, a World Cup gold medal and a World Title all in bobsledding. 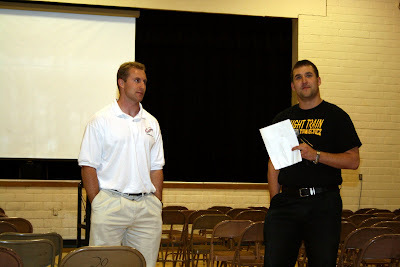 He spoke to the Exeter-Milligan students and community members on Wednesday afternoon in Exeter and gave them a peak into what he believes are the roots of his success. Shelby. It's the small town of Shelby "690 people raised $25,000 for me. No one Shelby had ever seen a bobsled. They did it on faith, believed in me. They didn't know I would make it to the Olympics," said Tomasevic. He shared both his story with the group and things that have made a difference. He emphasized how small towns work and support each other recalling an incidence when he was young where their football coach took the boys to help a farmer when they were supposed to be practicing football "because that's what small towns do. They do for each other." He named some of the many things he has done because he had that backing, visited the White House, watched the shuttle launch, joined Pearl Jam on stage, rode in a F-16, been on The Late Show with David Letterman, pictured on the cover of Sports Illustrated, will be throwing out the first pitch at a Chicago Cubs game. 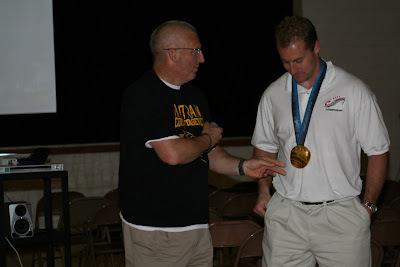 And while he shared with the crowd the outfit and shoes of a bobsledder and showed the clip of the run where they won the gold medal he wanted them to see the root of his success. He explained that they have to first of all "remember where you have been, then, where you are and finally where you are going. If you can do these things you will be successful. Remember your roots." Tomasevic kept the gold medal securely around his neck while he took photos with students and community members and also signed autographs. Tomasevic was introduced by Exeter-Milligan science teacher Grant Gabel who is also from Shelby and thanked by Principal Lindley Schlueter whose wife Melanie is from Shelby.